Amazon is in a tough spot in India, one of its largest markets outside the US. New government-issued norms, which kicked in just today, prevent foreign firms from selling their products directly to consumers. That means the retail giant is barred from hawking items under its own label, as well as those made available from local sellers that the company has invested in. 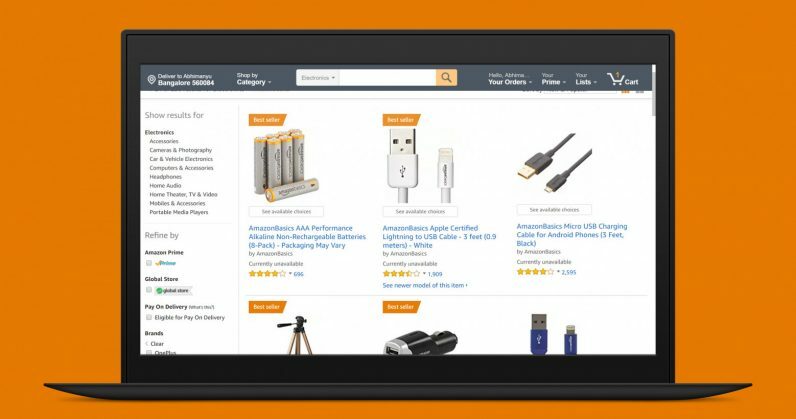 As a result, the entire range of AmazonBasics products – which includes everything from batteries to laptop cases to camera tripods – are currently unavailable across the country. Amazon‘s range of Echo smart speakers, meanwhile, are only available through third-party sellers on the site, and most of them are scheduled to ship weeks from now. While we remain committed to complying with all laws and regulations, we will continue to look to engage with the government to seek clarifications that help us decide our future course of action as well as minimize the impact on our customers and Indian sellers. The norms also prevent marketplaces from hosting more than a quarter of their inventory from a single vendor, and restricts their ability to present deep discounts. Businesses either owned fully or in part by the ecommerce platform are also barred from selling products on those sites. In addition, these sites can’t ink deals with vendors to sell products exclusively. According to CRISIL Ratings, these rules will cause both Amazon and Walmart-owned Flipkart revenue losses amounting to 40 percent by 2020 – about $5 billion each. It certainly seems like a precarious situation for these two major platforms. For its part, Amazon India said in a statement that it needed more time to understand how to navigate the new policies, and to address the concerns of more than 400,000 sellers on its platform. It’ll be interesting to see if these firms find ways around the new norms. They were put in place to help local retailers compete with giant foreign ecommerce players. According to NDTV, Amazon and Flipkart previously used its wholesale business entities in India to buy up thousands of products in bulk, sell them to vendors on their platforms, and then allow those vendors to offer the same inventory to customers. While they figure this out, Reliance Industries, a local conglomerate with a market cap of about $112 billion, is set to swoop in. The company plans to launch an ecommerce portal to rival foreign incumbents, and will extend its retail business ventures starting this April. India‘s ecommerce space will be worth tracking over the next couple of years, as it’ll see major players revamp their company structures and operations to meet the demands of a protectionist government in one of the world’s fastest-growing retail markets.